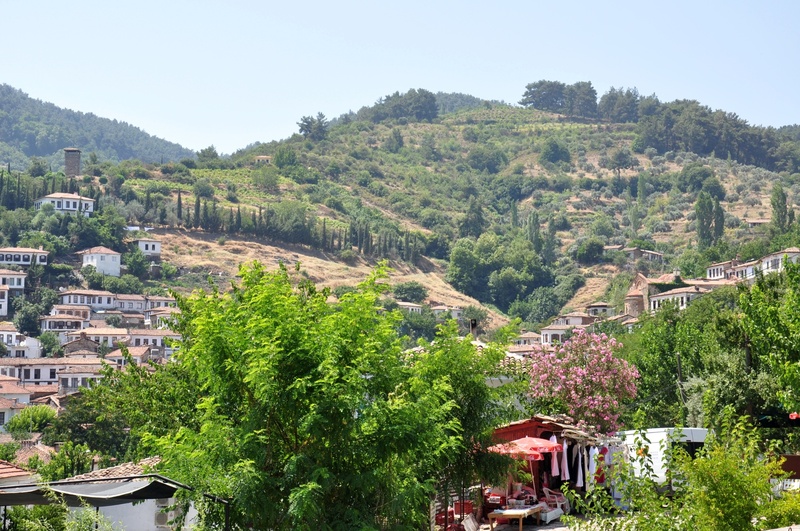 Many travellers find it hard to believe that Şirince, situated among scenic hills, surrounded by orchards and gardens, once bore the name Çirkince ('abomination'). The present name ('Charming') much better reflects the aesthetic experiences during a visit to this village. There are various stories about the origins of Şirince and its name. Most probably the place, with the name Solmissos (of Luvian roots), was founded by Ephesians who abandoned their city during the conquests of Timur and withdrew into the mountains. Another version tells of Greek slaves who settled there and called the place Çirkince (Turkish for ugliness) to deter others from living in this beautiful settlement. According to the third version of the story, 40 freed slaves settled there, and thus the village was originally called Kırkinca (from the Turkish word for forty — kırk or the Greek word saránta, also meaning forty). However, there is not much hard evidence to check the truth of all these legends. Careful seekers can find some fragments of Roman sewer system nearby a local spring and notice Roman funeral urns used as a fountain in the centre of the village. The ruined building from the Hellenistic period, possibly a tower, is the oldest trace of human activity in the surroundings of Şirince. Some 4 km to the south-west of the village there are the remains of a vaulted building in an orchard, which are probably the ruins of a Roman Villa. Another speculation connects the area surrounding Şirince with the grove called Ortygia which was described by Strabo: "[...] a magnificent grove of all kinds of trees, of the cypress most of all. It is traversed by the Cenchrus River, where Leto is said to have bathed herself after her travail. [...] Above the grove lies Mt. Solmissus, where, it is said, the Curetes stationed themselves, and with the din of their arms frightened Hera out of her wits when she was jealously spying on Leto. [...] There are several temples in the place, some ancient and others built in later times; and in the ancient temples are many ancient wooden images, but in those of later times there are works of Scopas; for example, Leto holding a sceptre and Ortygia [a nurse who gave her name to the grove] standing beside her with a child in each arm. A general festival is held there annually; and by a certain custom, the youths vie for honour, particularly in the splendour of their banquets there. At that time, also, a special college of the Curetes holds symposiums and performs certain mystic sacrifices." This story related by Strabo would mean that Şirince was founded in the location where the divine twins Apollo and Artemis were born. Taking into account the special reverence that the Ephesians granted to Artemis, it would explain the importance of the festivals, symposiums, and sacrifices mentioned by Strabo. Moreover, it is possible that the name of the Cenchrus (Kenxrios) River in time evolved into Şirince. The traces of the Byzantine period can be found in the orchards surrounding the village. They include the ruined structures dating back to the period from the 11th to 13th centuries, referred to as "monasteries" by the inhabitants of Şirince. There are also the traces of aqueducts from the same period, and Byzantine frescoes on the walls of Sütini and Kurudağ Caves, on the road from Selçuk to Şirince. Sütini Cave (known as Panaya Galata) was used as a chapel from the 13th century. At the entrance of the cave, faint traces of the frescoes depicting Christian saints can be seen. The writings engraved on the walls of the cave invoke Jesus and ask for his help. Hellenistic and Roman oil lamps were found in Kurudağ Cave and it is understood from the finds that the cave was used as a cult place in the ancient times. Until the 20s of the 20th century, the village was largely inhabited by Orthodox Greeks. 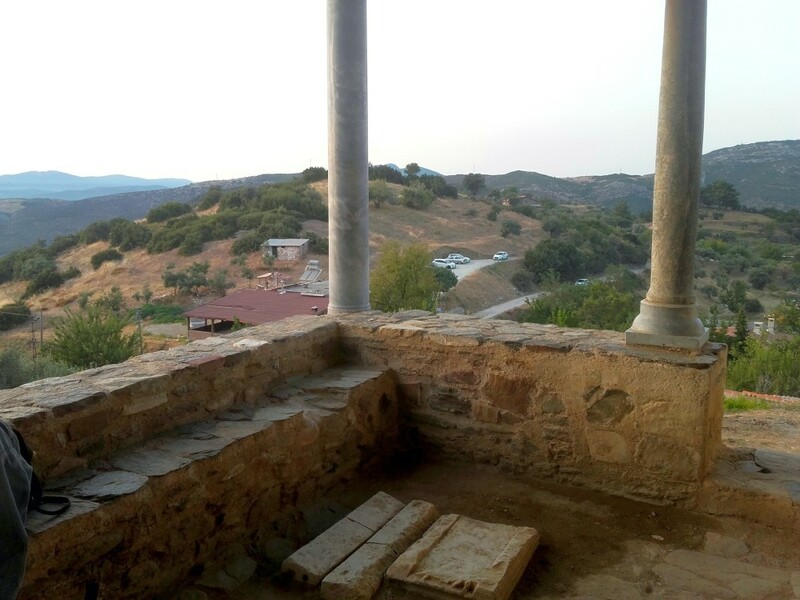 Despite the fact that these areas were under Turkish rule from the 14th century, Greek villagers kept a high degree of autonomy, had their churches and schools, and chose their mayor. 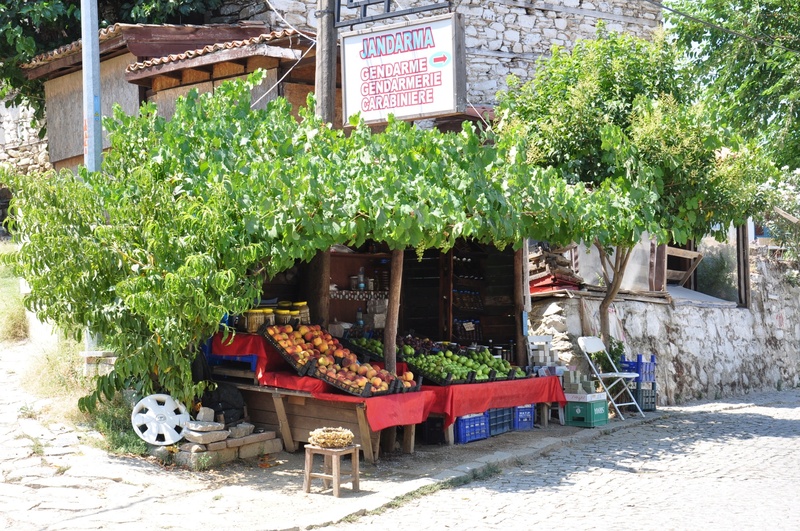 In the 19th century, Şirince, then called Kirkinje, experienced the time of great economic prosperity, its income arising mainly from the export of figs and tobacco. From this period comes a beautiful school building, currently housing a restaurant and a small private museum. During the Balkan Wars, in 1912, some Greeks from the village agitated for the annexation of this region to Greece. The Ottoman government responded with severe repressions, intensified during the First World War. When the Greek army invaded the western part of Turkey in 1919, many men from Kirkinje joined it, fighting against their Turkish neighbours. As a result of the population exchange between Greece and Turkey in 1923, the former inhabitants of the village were displaced to different areas of Greece. Their place was taken by the Turkish inhabitants of Thessaloniki. 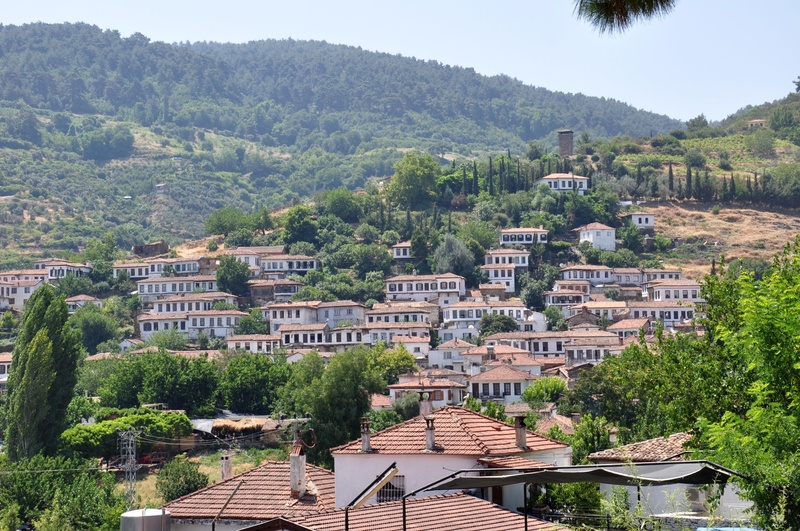 The descendants of the Greek inhabitants of Şirince now live in northern Greece, in particular, in the town of Nea Ephesos near Thessaloniki. The exchange of the populations inspired the Greek author Dido Sotiriou, a native of Şirince, to tell the story of the Greco-Turkish War through the eyes of a fictional character from Şirince, in the book "Bloody Earth", strangely translated for the English edition as "Farewell Anatolia". The book was a great international success, and it was translated into six languages, including Turkish. It is still very popular in Turkey, as the author said, "there are no evil Greeks or Turks, but only people who are victims and pay dear for it". Currently, about 700 people live in Şirince permanently. They are the descendants of Turkish immigrants who were resettled here from Kavala region in Greek Macedonia. They have preserved many traditions of that region, including the craft of preparing fruit wines, which are the most famous product of the village. The village got its present name in 1926, when the governor of Izmir, Kazım Dirik, gave renamed it as Şirince. The first two generations of immigrants experienced many difficulties and harsh poverty. Most of the 4,000 people who settled in Şirince, later moved to Selçuk and Izmir in search of work and a better life. Old rural houses fell into disrepair. The fate smiled to the people of Şirince only in the 80s of the 20th century, when first travellers arrived in the village. They discovered it for the world of tourism. In 1986, the road to Şirince had been paved, and the telephone line was established in 1993. The revival of Şirince is intrinsically linked to the fascinating figure of Sevan Nişanyan, a Turkish-Armenian linguist and travel writer. In the 1990s, he and his wife Müjde Tönbekici settled in Şirince. They worked hard to have the village declared a national heritage site. They also renovated ruined historical houses, using the original materials and building techniques of the village. 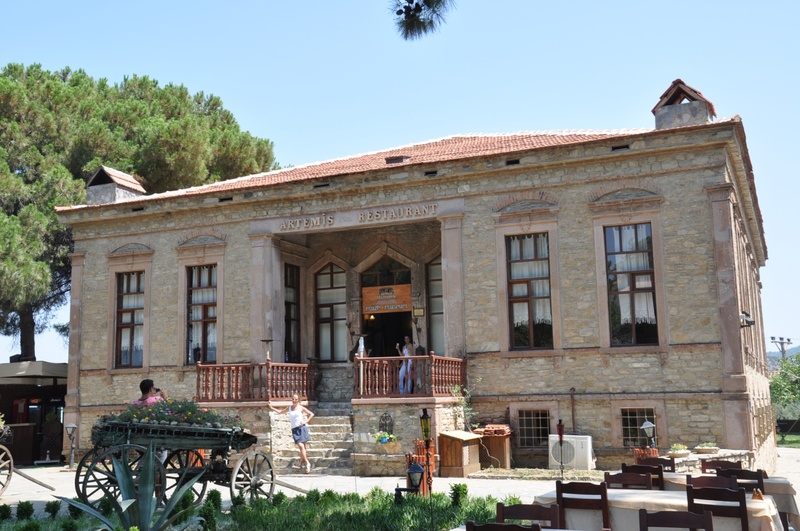 Another development inspired by Sevan Nişanyan was the Nesin Mathematics Village (tr. Nesin Matematik Köyü), established in collaboration with Ali Nesin, a prominent mathematician and philanthropist. The village, situated some 800 meters to the north of Şirince, was built along the lines of traditional Aegean rural architecture. This village/education centre offers summer courses in mathematics and attracts prominent lecturers from around the world. 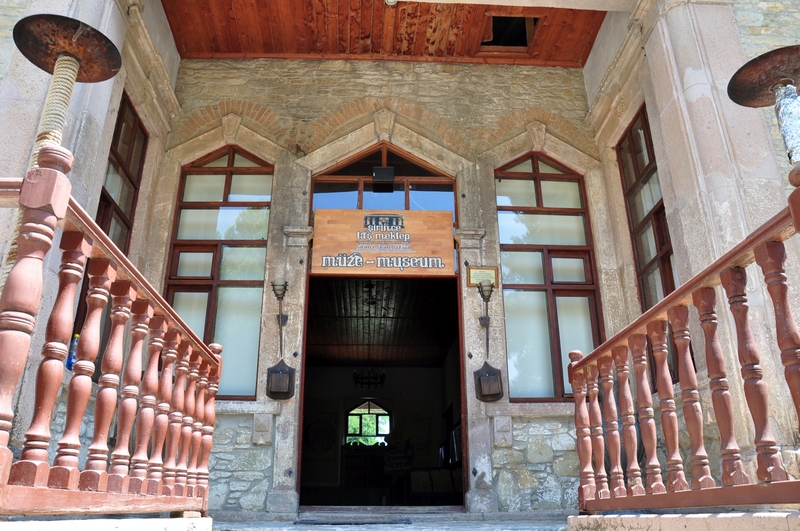 Moreover, Nisanyan built Theatre Madrasa and Nisanyan Memorial Library on the grounds of Mathematics Village. In 2012, Nișanyan unveiled his Rock Tomb — an Ionic order facade in the manner of ancient Lycian rock tombs — measuring eight by five metres. It was carved into a limestone cliff facing the Mathematics Village near Şirince. However, not everything went smoothly for Sevan Nişanyan who was sentenced to 16 years and 7 months in prison after he castigated the government’s attempts to prohibit criticism of the prophet Muhammad, in a blog entry in September 2012. In an amazing twist of events, he escaped prison in 2017 and settled in Samos, where he lives in exile in the village of Pagóndas. Moreover, the future of the Mathematics Village is also uncertain as there were some announcements that it was slated for demolition by the authorities as being an "illegal construction". 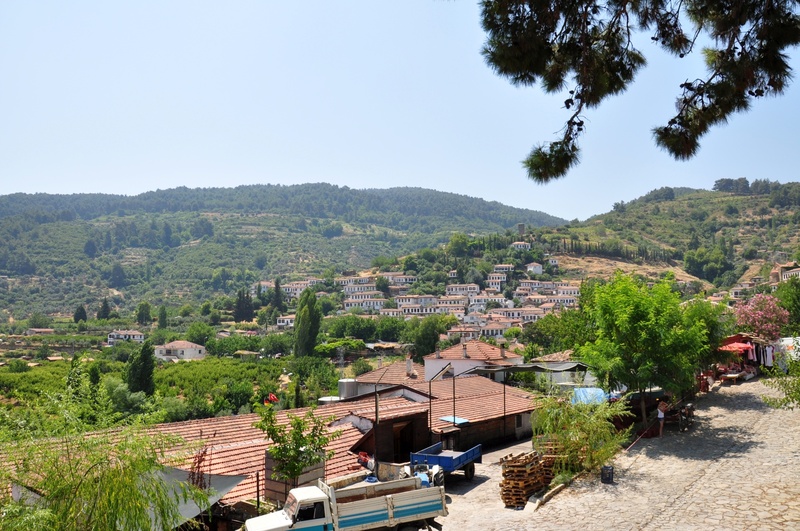 Hopefully, it will not be the case because Harun Abuş, Director of Development and City Planning of Selçuk Municipality, declared that at this moment Nesin Mathematics Village is "not on the demolition calendar". 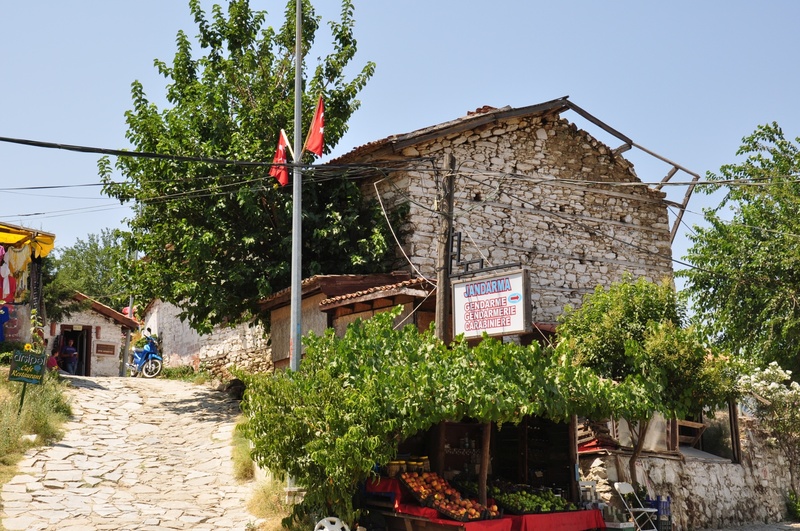 In the 90s of the 20th century, first travel agencies began to transport holidaymakers to Şirince, to show them an 'authentic village in the mountains'. Since then the number of tourists has grown steadily, severely diminishing the authenticity of Şirince as such a place. Restaurants, hotels, guesthouses, and souvenir shops sprang up. 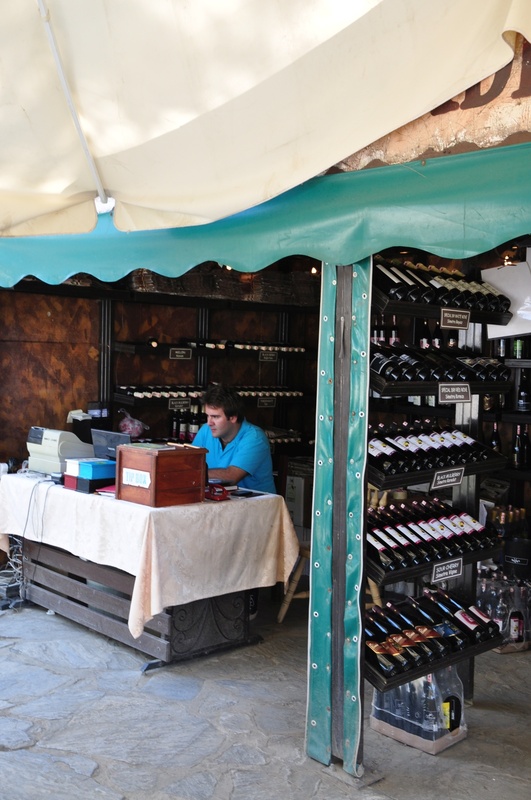 The residents began to reap profits from selling embroidered fabrics and locally produced wine and olive oil. The increase in revenues allowed the restoration of many historic buildings and stopped the outflow of young people who previously did not see their future in this village. Şirince acquired world-wide fame as "Doomsday safe haven" when tourists flocked to the village in December 2012 to witness the Mayan Apocalypse, as New Age mystics believed its positive energy would aid in weathering the catastrophe. This theory resulted from the vicinity of Meryemana where the Virgin Mary was supposed to ascend to heaven. However, despite the high expectations of Şirince residents who anticipated to host over 60,000 visitors, only a fraction of that number actually arrived, with a substantial component being police and journalists. Today Şirince is hardly a forgotten village in the mountains, especially during the summer season when lots of tourists visit it. In the middle of summer, the streets of the village are full of travellers seeking the lost charm of the village. Its main street turns into a promenade with the ubiquitous souvenir stalls. Therefore, it is far better to visit Şirince in spring or autumn and avoid the weekends. 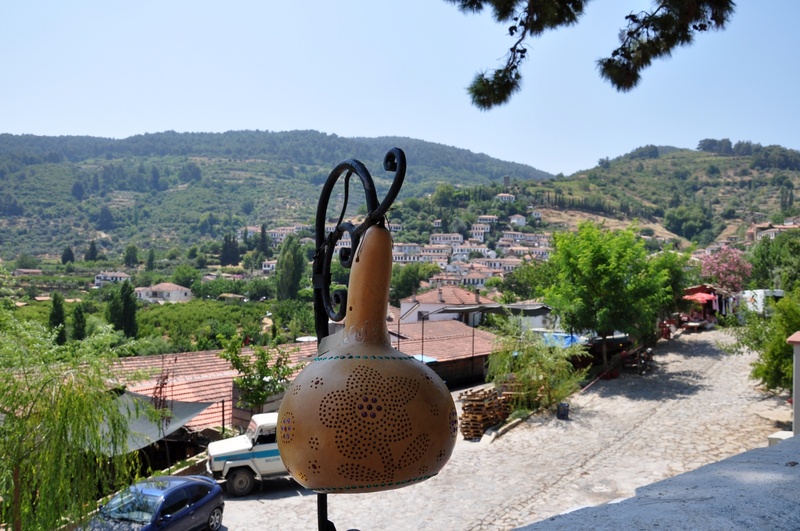 The village is an interesting example of the synthesis of Greek and Turkish influences. The old Greek houses have preserved their traditional appearance on the outside, but their interiors are now decorated in Turkish style. Many of these houses can be visited, as some have been turned into hotels, restaurants, or venues for the vacation rental. 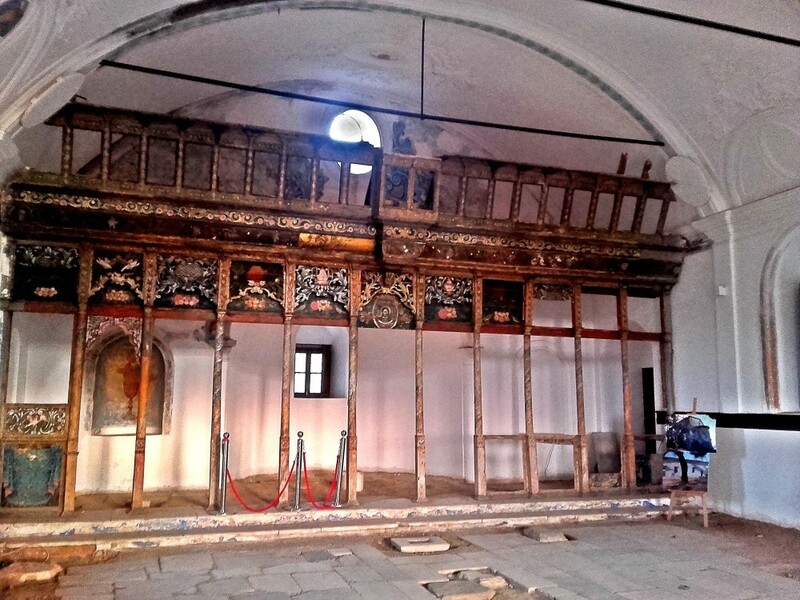 According to the survey conducted by Kivilcim Nese Akdogan, there are 125 historical buildings in Şirince that reflect the living conditions and the construction techniques of the 19th century. It is a relatively small proportion as there were around 1800 buildings in Şirince in the 19th century. 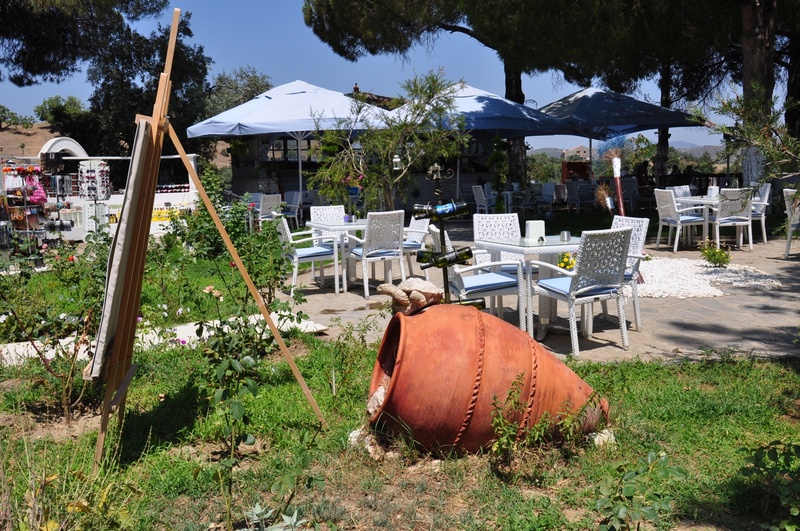 The most important historical structures of the village include two churches, two fountains, a traditional olive oil factory, one furnace, one primary school (today housing Şirince Artemis Restaurant), and seven shops. Moreover, there are 111 traditional houses, mostly used as the residences but 19 of them were turned into small hotels. In Şirince, there are two historical Orthodox churches. The first one, dedicated to St. John the Baptist, was restored around the year 2000 with the funds provided by a Christian association from the USA. 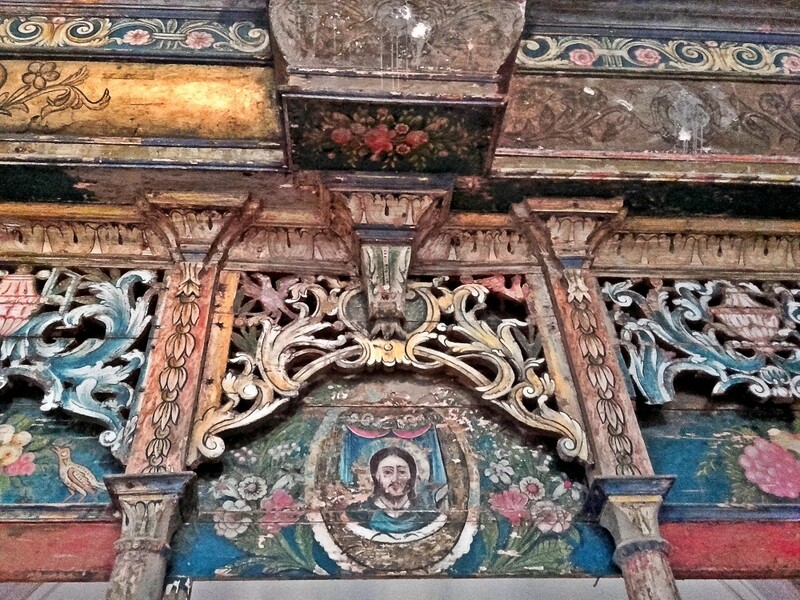 In its interior, you can see faded frescoes, which date back to the Byzantine era. There is also a wishing well. According to the local lore, the basement of the church was traditionally used for maturing locally produced wines. Church of Saint Demetrios (tr. Aziz Dimitrios Kilisesi) was built as the second church of the village, after the Church of Saint John the Baptist. Unfortunately, the exact date of its construction is unknown. Most often it is stated that the building was erected in the seventeenth century, and the foundations and basement are even older. The church was given the name of Saint Demetrios of Thessaloniki who was born around 280 and died around 304-305. He is a martyr and a saint of the Catholic, Orthodox, Coptic, and Armenian Churches. The earliest written accounts of the life of Demetrios were collected in the 9th century, although there are some earlier pictures of him. There is also a collection of sermons written in Greek, describing the miracles he performed. According to these early accounts, Demetrios was born into a family of pious Christians from Thessaloniki. He is presented as a young man from a senatorial family who died a martyr's death, run through with spears around 306 CE, during the Christian persecutions of Galerius and Diocletian. As time went by, the cult of Saint Demetrios developed in an unexpected direction. In the 6th and 7th centuries, Thessaloniki endured repetitive attacks and sieges of Slavic peoples that had migrated to the Balkans. Demetrios was credited with many miraculous interventions to defend the city. Therefore, the later tradition treats him as a soldier of the Roman army. Demetrios was also venerated as the patron of agriculture, peasants, and shepherds during the Middle Ages. Possibly, he had inherited this role from the pagan goddess Demeter. Currently, Saint Demetrios is considered to be the patron of soldiers of the Orthodox and Catholic churches. The faithful also pray to him in the face of the threat of invasion of the infidels and for the restoration of sight. 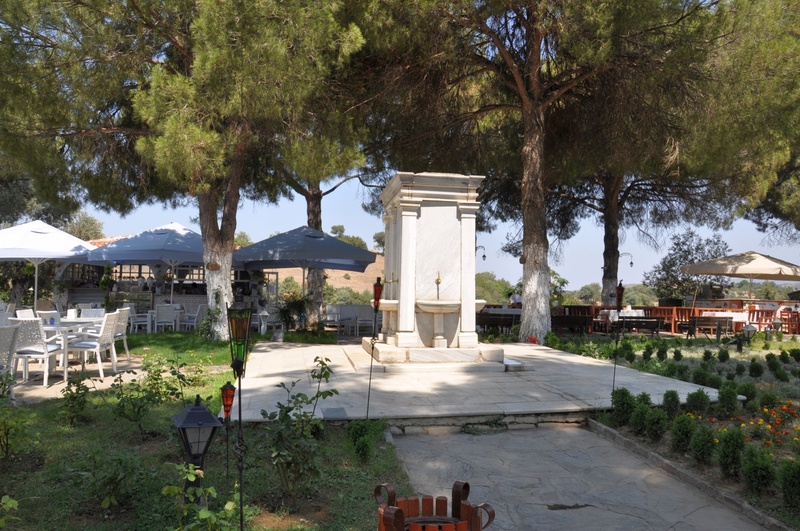 The church dedicated to Saint Demetrios in Şirince was the starting point of a five-hour pilgrimage of the faithful to the House of the Mother of God, now known as Meryemana. The procession started on the 15th of August every year, and followed the trail to the House of Mary on the hill of the Nightingales, on the other side of the town of Selçuk, about 15 kilometres west of Şirince. These pilgimages continued until the 1920s when the Treaty of Lausanne ordered a population exchange between Turkey and Greece. From that moment the village was inhabited by Muslims. The Church of Saint Demetrios and the Church of John the Baptist were abandoned and gradually fell into disrepair. 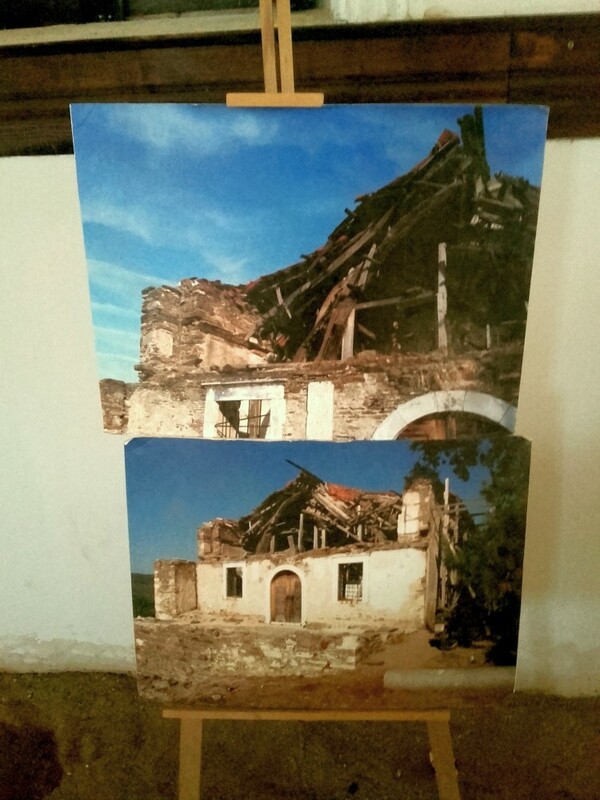 The roof of the Church of Saint Demetrios collapsed, and the terrible condition of the building before its repair can be seen on the photographs exhibited inside. The general renovation carried out in 2015 restored the church to its former glory. While visiting the church, it is worth to pay attention to the preserved iconostasis — a decorative wall of icons and religious paintings, separating the nave from the sanctuary. From the vestibule of the church, there is a beautiful view of the part of the village, olive groves, and arable fields. Next to it, there is a teahouse and an outdoor cafe where you can relax after climbing up the hill where the church is located. Right at the entrance to the village stands Artemis restaurant. 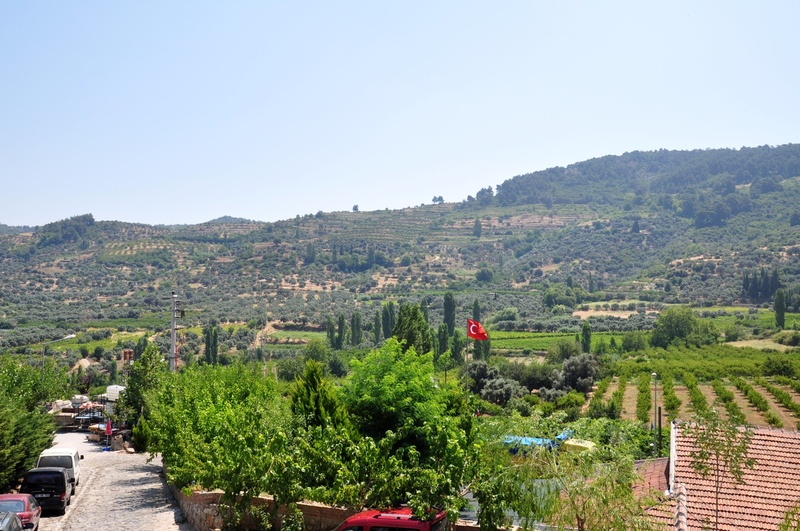 It is located in an area that offers a magnificent view of Şirince. In addition to the dinner dishes, this venue sells fruit wines. The restaurant makes an impression of an expensive option, but in reality the prices do not differ drastically from standard prices in other premises. Opposite this restaurant stands its competitor — Şirincem restaurant, whose owner is also a fruit-grower. Meals can be eaten outside, in the shade of trees. The restaurant specializes in dishes of stewed meats and, of course, sells wine, both its fruit variations and traditional, made from grapes. The most famous product of Şirince is fruit wine, produced locally from many kinds of fruit, including apricots, blueberries, mulberries, and melons. Additionally, you can buy many local products, manufactured using traditional methods. Among them worthy of recommendation are: olive oil, vinegar, honey, pekmez (thick fruit syrup), and nar ekşisi (pomegranate sauce). By public transport: there are half-hourly minibuses from Selçuk to Şirince. The earliest one starts at 8 am, and the last one in summer departs at 8:30 pm. The journey takes just 15 minutes. By car: turn off the İzmir-Aydın highway in the direction of Selçuk, in Belevi. 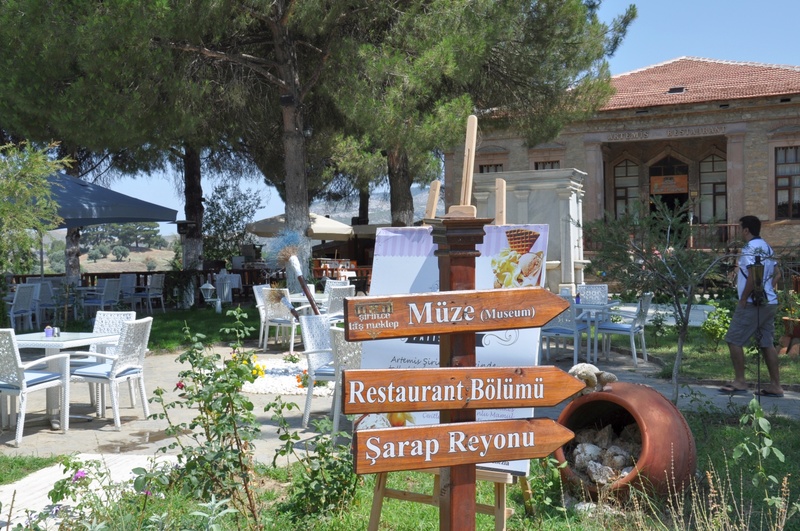 Drive to Selçuk (11 km) and from its centre follow the signposts to Şirince. The last leg of the journey is a mountain road, narrow and winding, but of good quality. 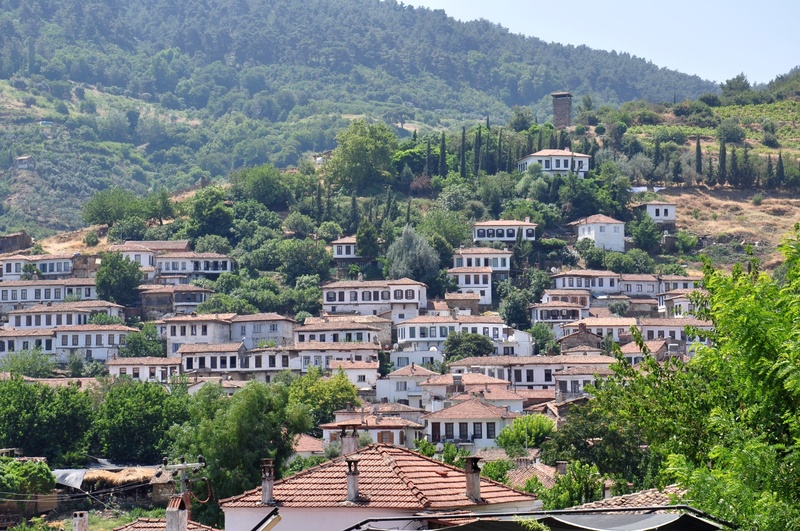 Staying overnight in Şirince may be hard for travellers with a tight budget. Suffice to say that the price of 150 TL for a double room is an extremely cheap option in this village. 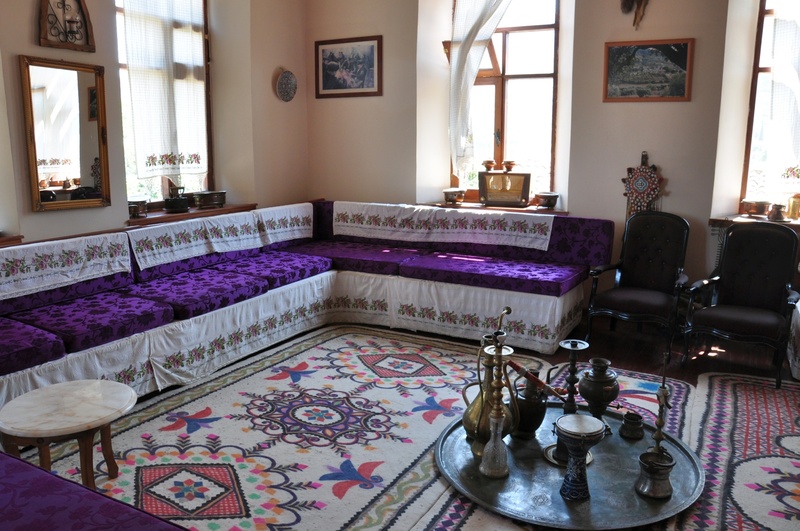 If you want to spend such amount for accommodation in an elegantly restored, historic interior of the traditional Greek house, Şirince has some interesting offers. Erdem mansion — elegantly furnished and praised for the breakfasts.